It was a procession to Char-e-Sharif. Shabir Shah was participating in it. My mum tells me that I was in a servant’s lap, while some of my family were watching the procession going through the main road. It was a call to freedom during those fearful days of insurgency. It was then that my family tells me that my first babbling was a babbling of freedom ‘Azaadi’. I have lived in the outskirts of the Srinagar city, Baghi-Mehtab, which was previously called as ‘Karnal Bagh’. It was an enormous property of a wealthy army man that was eventually taken over by the government. A land filled with peach trees, an estate of foliages. My grandfather used to tell me old lores about this place. During the olden days, it was so quiet and haunting at night that he used to praise the courage of my grandmother who used to wait for him till he broke his hunger with a late supper. Years after, since this large green estate was converted into a housing colony, with a mix of elites, upper middle class, and lower middle class dwellers living in the area, Baghi-Mehtab was known for its Jehadi hostility during the troubled times. As a kid, I used to psychologically unsettle with each gun-shot I heard. In one of my childhood days, an encounter with militants and army happened near our gate on the main road. It were our neighbours and my family who spilled water on blood to clean the road in an effort for the normal life to return. I still have vivid memories of how the Jehadis used to ask for charity ‘Chanda’, and the trouble that came after when Indian army used to enter our houses in long boots, making our praying chambers dirty, and then asking my family extremely difficult questions. I also grew amidst a growing ‘Ikwani’ (pro-government gunmen) culture. I still remember a horrifying tale that occurred just in my neighbourhood. Some undercover Ikwanis had put sedatives in the food of some Jehadis. They then dug a hole and beheaded them during the night like lambs to slaughter. Beheadings were common in my area. Some heads even used to hang on trees with their names engraved in Urdu, on their foreheads ,through knives. Some were taken into the timber factory and their bodies were cut into two pieces on the machines. My uncle ‘Chacha’, an engineer and businessman, who now lives prosperously in Los Angeles, was once taken by the army and beaten for no reason of his. 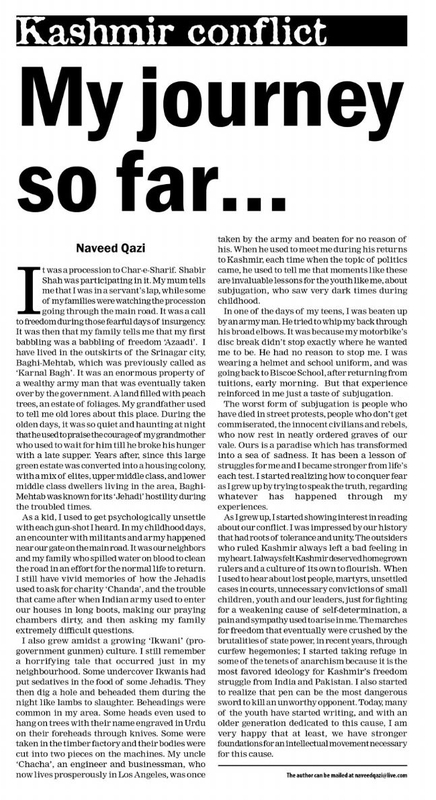 When he used to meet me during his returns to Kashmir, each time when the topic of politics came, he used to tell me that moments like these are invaluable lessons for the youth like me, about subjugation, who saw very dark times during childhood. In one of the days of my teens, I was beaten up by an army man. He tried to whip my back through his broad elbows. It was because my motorbike’s disc break didn’t stop exactly where he wanted me to be. He had no reason to stop me. I was wearing a helmet and school uniform, and was going back to Biscoe School, after returning from tuitions, early morning. But that experience reinforced in me just a taste of subjugation. The worst form of subjugation is people who have died in street protests, people who don’t get commiserated, the innocent civilians and rebels, who now rest in neatly ordered graves of our vale. Ours is a paradise which has transformed into a sea of sadness. It has been a lesson of struggles for me and I became stronger from life’s each test. I started realising how to conquer fear as I grew up by trying to speak the truth, regarding whatever has happened through my experiences. As I grew up, I started showing interest in reading about our conflict. I was impressed by our history that had roots of tolerance and unity. The outsiders who ruled Kashmir always left a bad feeling in my heart. 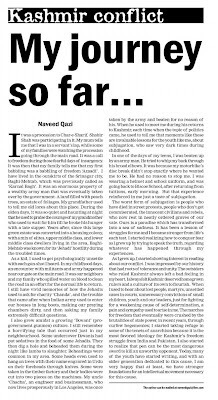 I always felt Kashmir deserved homegrown rulers and a culture of its own to flourish. When I used to hear about lost people, martyrs, unsettled cases in courts, unnecessary convictions of small children, youth and our leaders, just for fighting for a weakening cause of self-determination, a pain and sympathy used to arise in me. As the marches for freedom that eventually were crushed by the brutalities of state power, in recent years, through curfew hegemonies, I started taking refuge in some of the tenets of anarchism because it is the most favoured ideology for Kashmir’s freedom struggle from India and Pakistan. I also started to realise that pen can be the most dangerous sword to kill an unworthy opponent. Today, many of the youth have started writing, and with an older generation dedicated to this cause, I am very happy that atleast, we have stronger foundations for an intellectual movement necessary for this cause.